Assassin’s Creed hasn’t had multiplayer in quite a while, but Ubisoft says that may soon change. With the rise of games as a service it makes business sense to return to the concept, and despite the series’ general focus on single-player its multiplayer options have been surprisingly robust and entertaining. Ubisoft wants its tech to be able to support those features again. “I want our game to become a place where there are many changes and new events,” Hascoet tells Game Informer. “Even in Assassin’s Creed. We have to change our games’ agility. We have to consider mobile crossovers. There are millions of changes I would make. 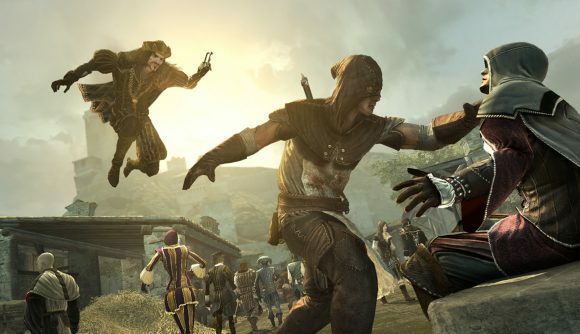 Assassin’s Creed first got multiplayer in Brotherhood, and while that development came at the height of single-player games receiving unnecessary multiplayer modes, the social stealth gameplay worked far better than anyone had anticipated. Black Flag was the last game to feature the competitive mode, and Unity’s co-op mode was the last time multiplayer of any sort featured in the series. Some event-style features – like those Hascoet mentions – were in Origins, and are poised to return in Odyssey. Assuming the feature isn’t vastly expanded, that’ll mean daily and weekly quests to clear out bandit camps or take out recurring bosses. Fun bits of repeatable content, but not the kind of world-altering changes many modern games now traffic in. In this same interview Hascoet also addresses the possibility of a new Prince of Persia or Splinter Cell. The Assassin’s Creed Odyssey release date is coming up soon, and while it won’t have any meaningful multiplayer features, it seems that’s apt to change for whatever the next AC may be.